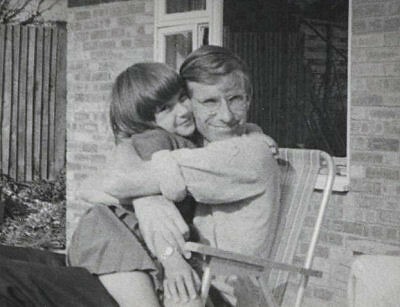 Oh Nic, what a warm, tender and loving photograph that is of you and your dad. My only attempt at butternut squash was terrible. First of all - I had no idea how to peel it. I've learned since then, but have not attempted butternut squash. Yours looks delicious. Since your dad was always behind the camera, I'm sure he'd appreciate your pictures too. Thank you so much Nic for sharing your heart and your father on LiveSTRONG Day. A beautiful dish and such lovely hearts. Thank you. Mmm, sounds yummy! 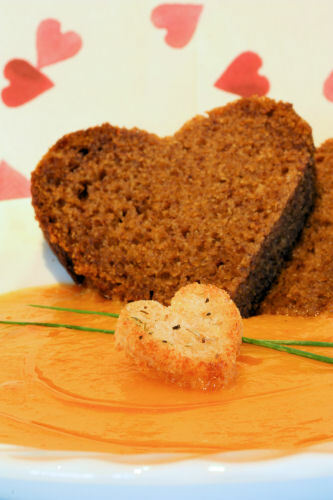 And I love the heart-shaped croutons! Thank you for reminding me that I need to get my Taste Of Yellow done as well!!! What a touching post Nic, and beautiful too. I agree; take loads of pictures as often who you love most is behind the camera! What a lovely picture you've posted there. Love the soup too ... bookmarked! HUGS my friend, many of them! Cynthia - thank you, I just found that photo at my mum's house last week. Merut - Thanks! I only discovered how delicious butternut squash was a couple of years ago! Give it a go, it's wonderful roasted with red peppers and onions. Barbara - Thank you so much! Charlene - Thank you! And croutons are the easiest thing in the world to make a dish look pretty! Chele - Thanks! I'll look forward to seeing yours. Johanna - yes, I do think of him often! Thank you for visiting. Deeba - hugs to you too! and I hope you are having plenty of photos taken of your own self!! I touching reminder Nic of cherishing each moment with our loved ones. You've got me thinking about what sunshine on a plate I could conjure up on this grey old Sunday. What a lovely tribute & ode to your beloved dad! This soup truly looks so appetizing,..I love the toasted hart in the middle of your lovely spiced up soup! This is such a tribute to your dad from start to finish Nic. Barbara;s event is such an inspiration. Love the smoky spices you've paired with the sweet squash. Nice yin-yang of falvours. 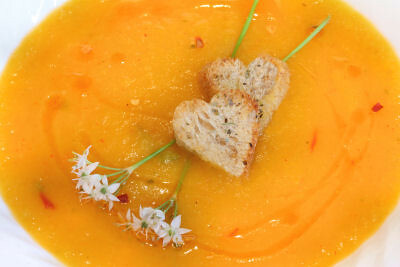 Beautiful tribute to your dad, love ur pif with dad...loving ur super cute soup, slurp delicious! Possibly the cutest and most beautiful soup I have ever seen! Very sweet photograph of you and your Dad. That's a beautiful photo of you and your dad. Great post, and a wonderful tribute to your dad. I like the pic of you and your dad. You both look so happy. lovely soup & a lovely tribute! a lovely post! i just love the photograph of the two of you. the soup warms the heart a little more. Nic - thanks! what a ghastly day eh? Hoping for sunshine next week! Sophie - thank you so much! Valli - I agree, it is! Peter - thank you! Chillies and squash go sell together. Hazel - how sweet, thank you! Su-yin - how kind, thank you! Vanille - lovely memories for me. Thanks so much. petite nyonya - thank you! MeetaK - thanks, I just recently got that photo and am so glad I did! Hi Nic...that's a lovely picture of you and your dad...that's a really biiiig hug! I lost my dad to cancer when I was 16 so I know how you feel about it. I love butternut squash....but what a faf to peel it! I mostly just cut it in half scoop out the seeds and roast it. 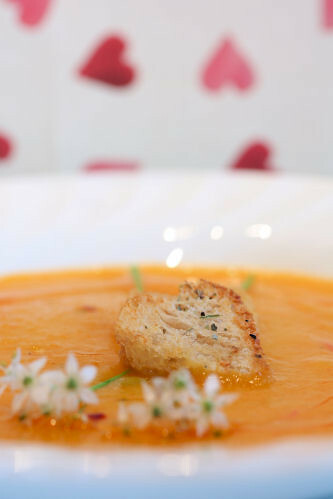 Your Butternut squash soup looks so inviting and delish! What a lovely tribute to your Dad and a lovely photo of you both. I have a butternut squash just waiting to be turned into soup tomorrow and was looking for a good recipe - what a coincidence! What a lovely posting Nic. The soup looks really rich and spicy. I can't imagine the speed with which that happened to your dad and your family, it makes me think how we have to live more in the moment as we don't know what's around the corner. It is a wonderful picture of you together. On a cheerier note, you really don't look old enough to have a son at university! What a beautiful soup! I could dive right in! Roasting one is a great idea! Antonia - I hope you made good use of your squash, it's one of my favourite vegetables! Sasa - thank you for your sweet comment! Sarah - we really do have to live more for today, you just don't know what tomorrow brings! Ha ha, very funny - I left my zimmer frame behind when I went to the FBC!